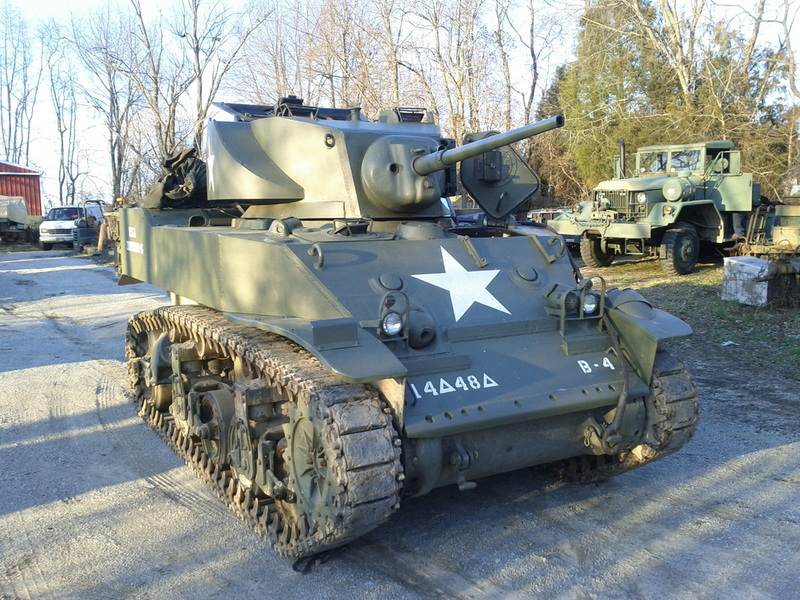 Yet another Stuart tank. Battle tested and ready for more. Here is B4 after a long winter break. 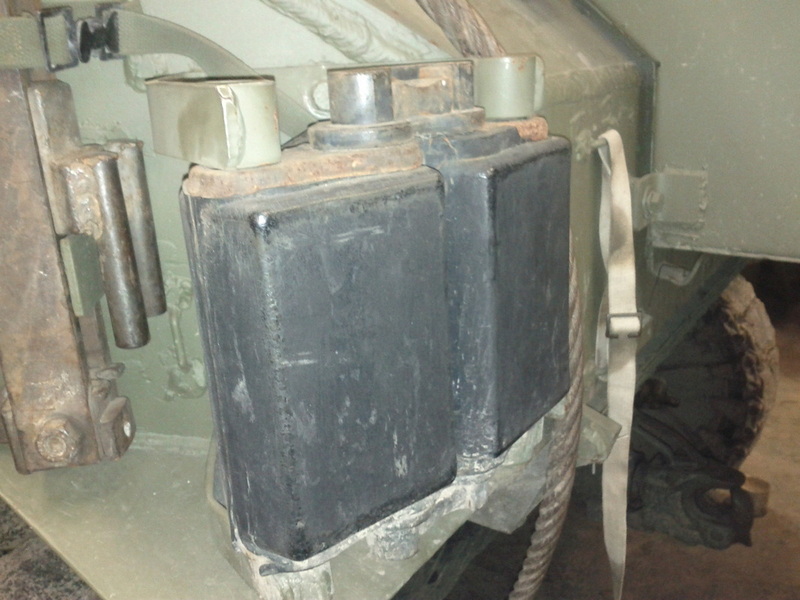 Several items were repaired over the winter, most notably the turret hydraulics. B4 is equipped with rubber track. Here are two sections called track blocks. The Stuart came with four spare blocks from the factory. In the left of the picture you can see the track jack, this is used when changing track or individual blocks. After the trip to Atterbury (2013) we found that B4 was making terrible noises. The new muffler may have been blown out and the other engine now had a new exhaust leak. 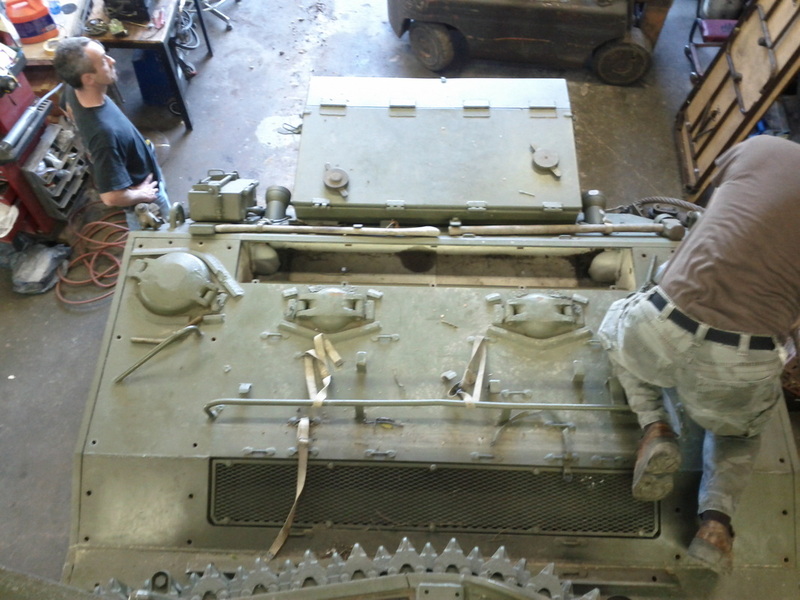 Here is the rear of the tank with the armor removed. The radiators are positioned over the engines. 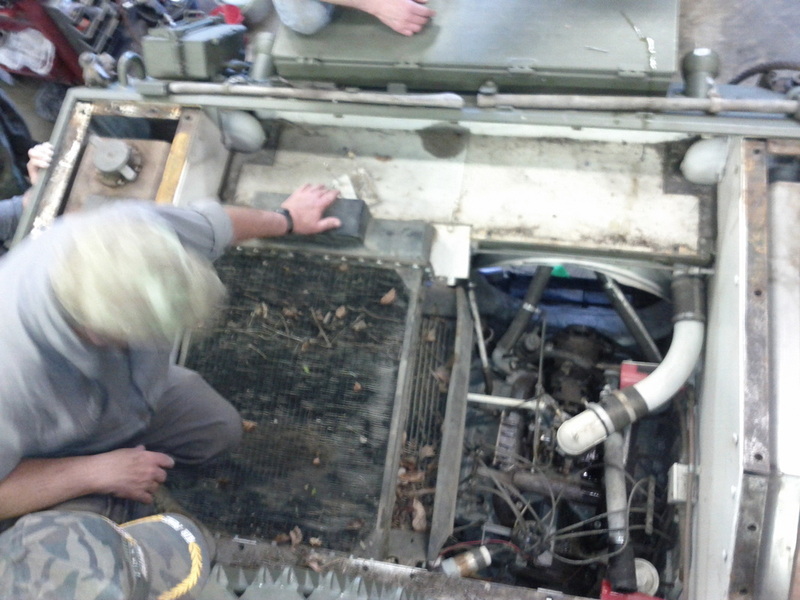 To access the engine, the radiator must come out. This thing is HEAVY! 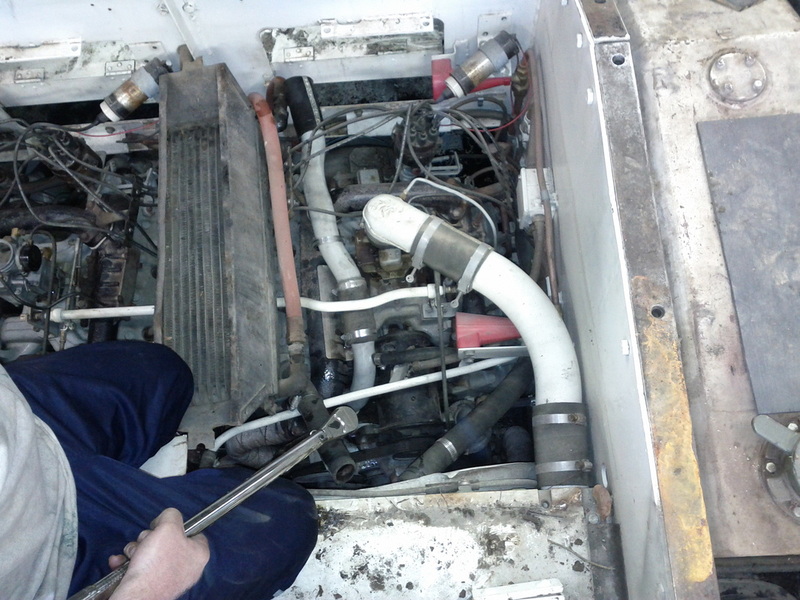 Of course the fluid is drained at this point, the hoses removed, and mounting bolts removed. Take note of several items in this picture! 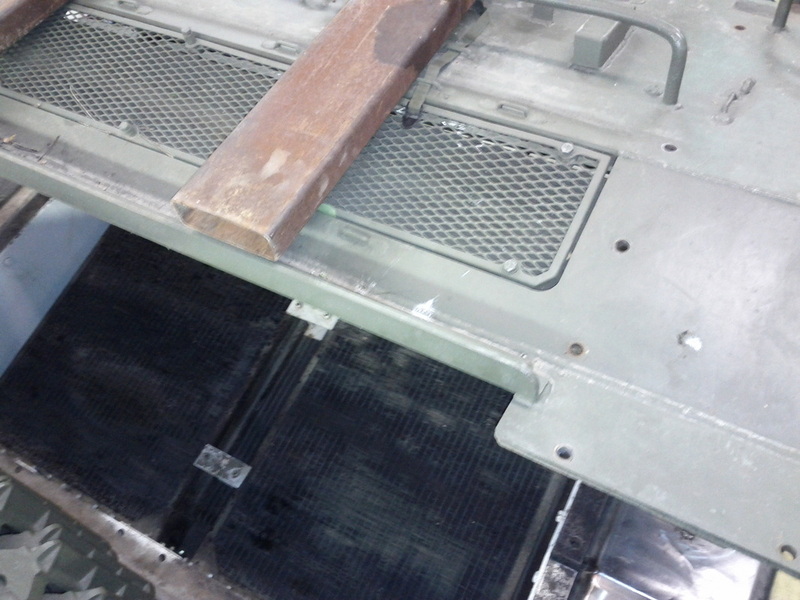 The lifting tabs built onto the radiator, the oil cooler mounted inbetween (but below) the radiators, and the stainless steel gas tank visible on the right side. 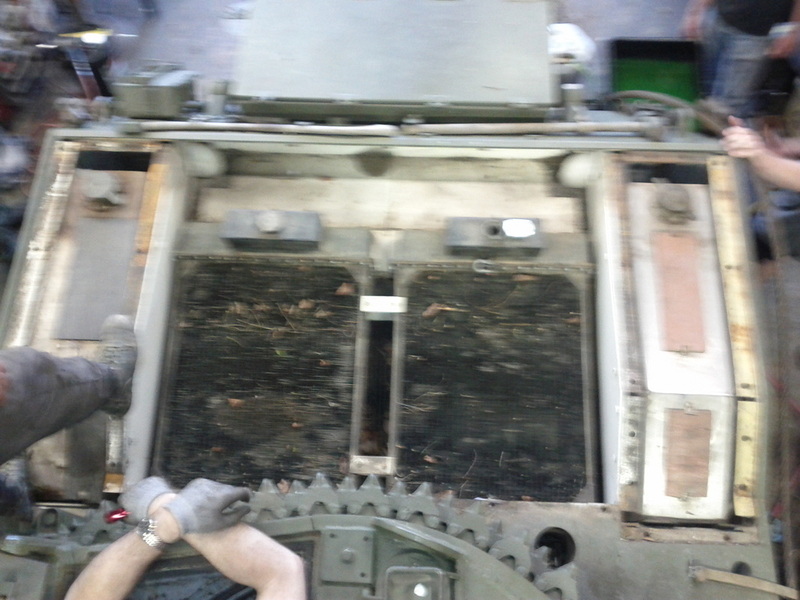 Here is the top of the engine with all obstructions removed. It may appear that Glenn's knee is on the other radiator, but I was there. He never touched it! 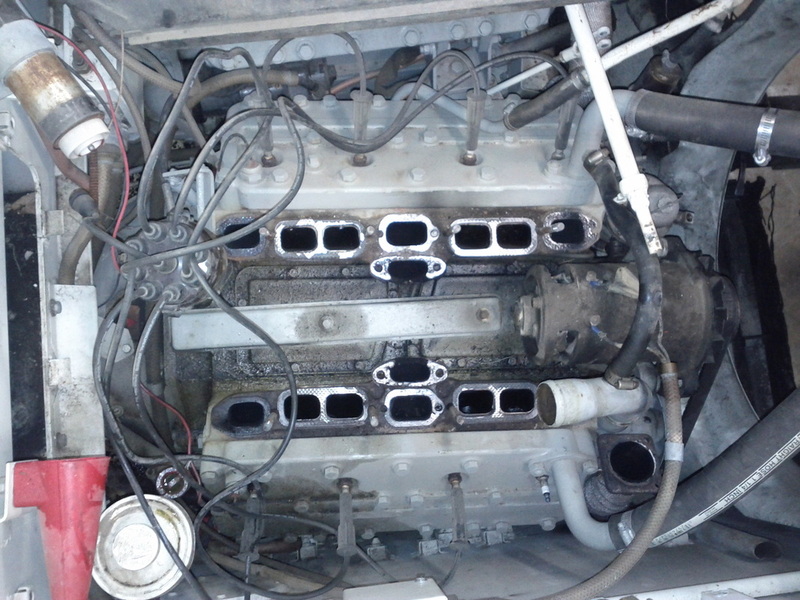 The intake and exhaust manifolds have been removed, along with many hoses, wires, linkages, and such. Take a look at the exhaust crossover passages in the center of the engine. Note the inside edges are burned. 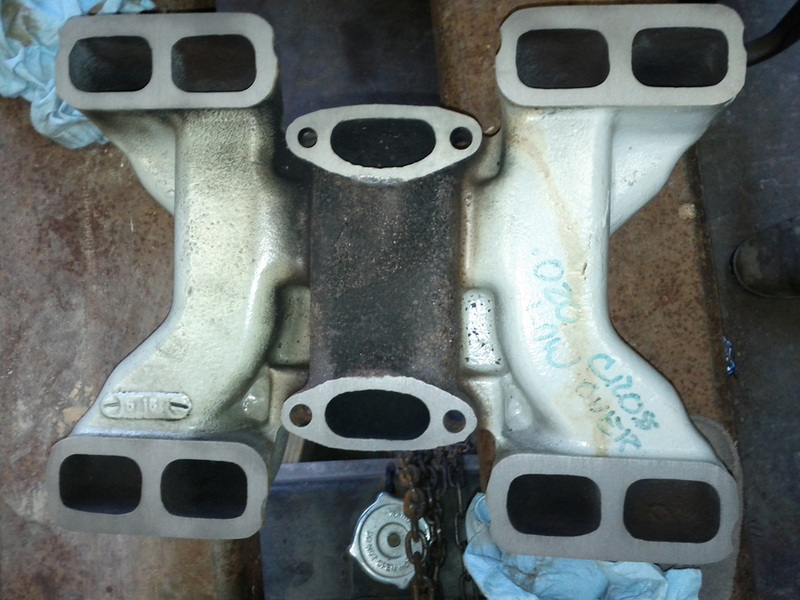 Here is the bottom of the intake manifold. Note the clean, freshly leveled metal. Now this should make a great seal with the engine block. 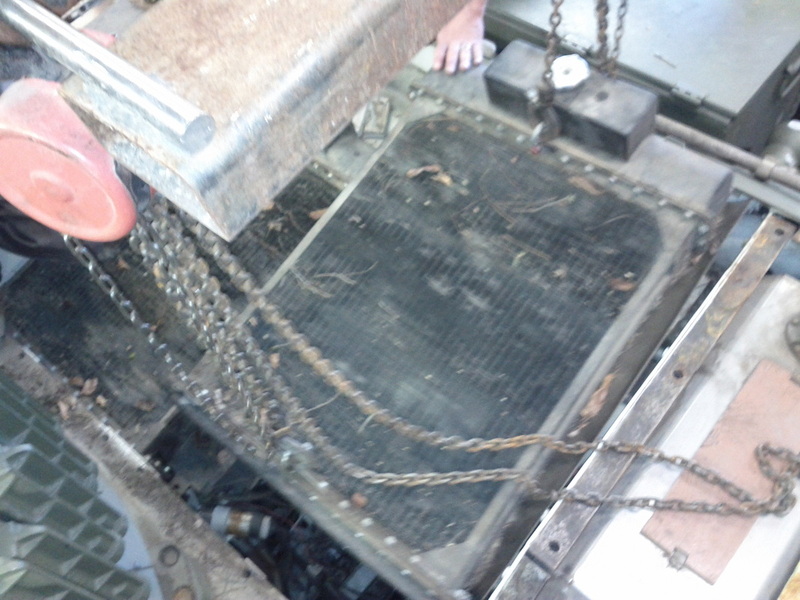 So before putting it all back together, we took off the other radiator too. Why? 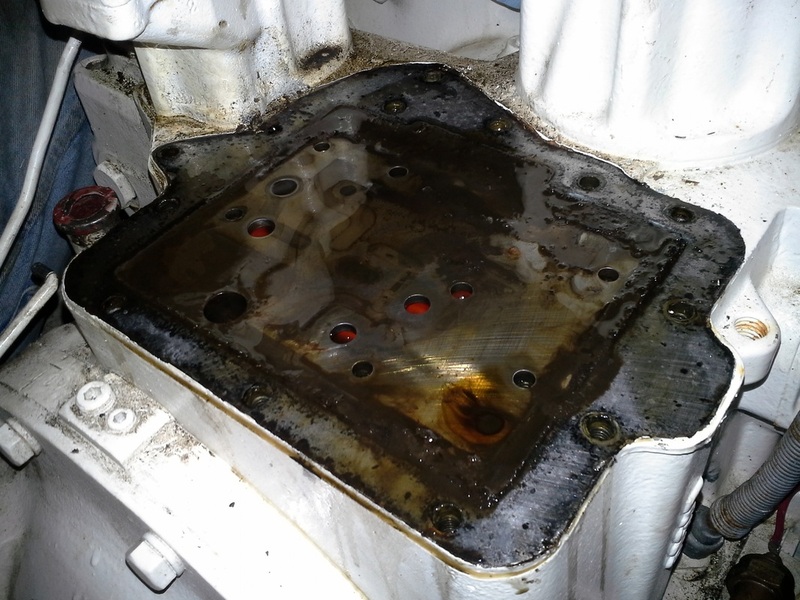 The engines were likely serviced at the same time before, better check the other engine before it breaks. As it turned out the gaskets were OK, but the intake/exhaust bolts did need a retorque. Take a look at that oil cooler in the middle of the two engines! This is an action shot of the rear deck armor being lowered back into place. A forklift is a must! 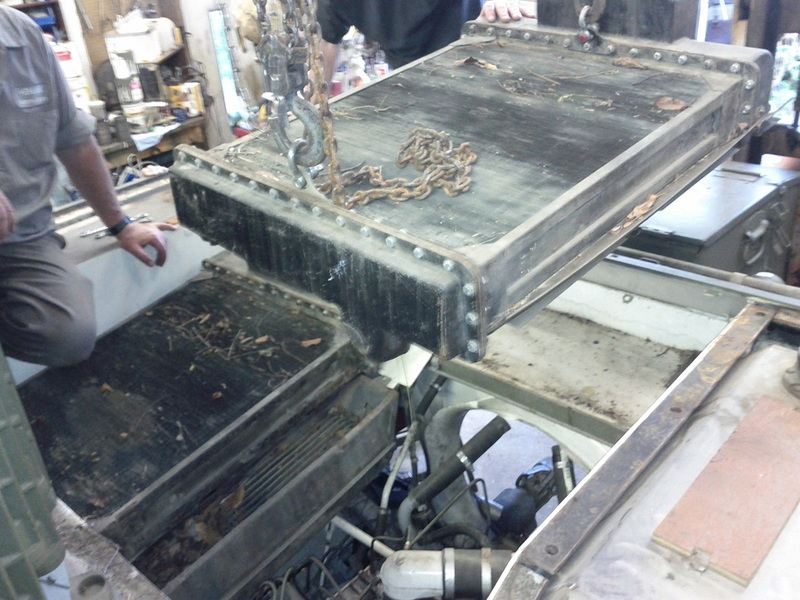 Take a look at those radiators, freshly cleaned and any errant fins straightened up. Here is B4 getting the track reinstalled. This is incredibly dangerous, a hand could be crushed and stuck if the driver or track handlers don't cordinate perfectly. Take note of the way the track is carefully moved from wheel to wheel as it is pushed along by the sprocket. Once the track gets in place, it has to be attached. Here is where track jacks are brought into the process. Slow and easy does it. Each side must be drawn together at the same time. There is a lot of tension on the track, you really don't want it to come undone now! 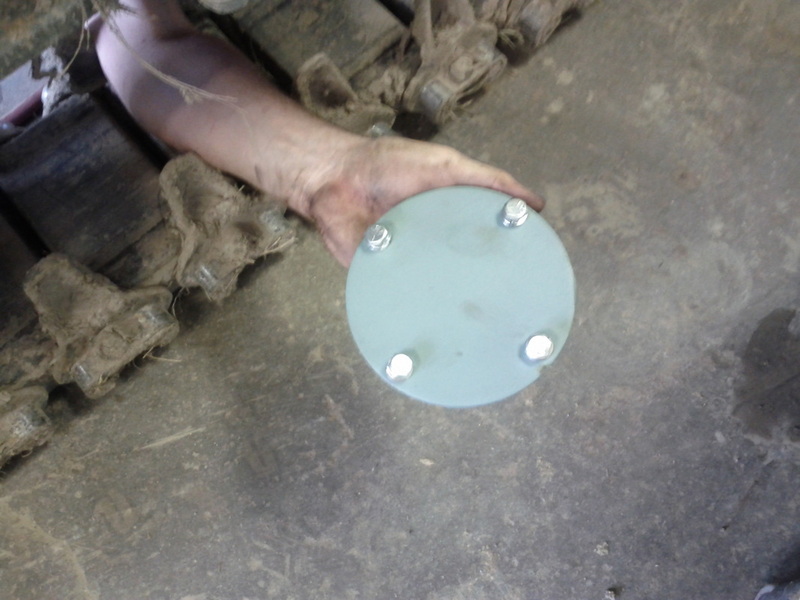 Here is a new metal plate that mounts to the bottom of the tank. There are several small inspection plates like this and then several large plates for bigger jobs. The final drive wasn't shifting into high range on B4. This could have been caused by low fluid levels, but in this case there was stuff in the final drive that needed cleaning out. 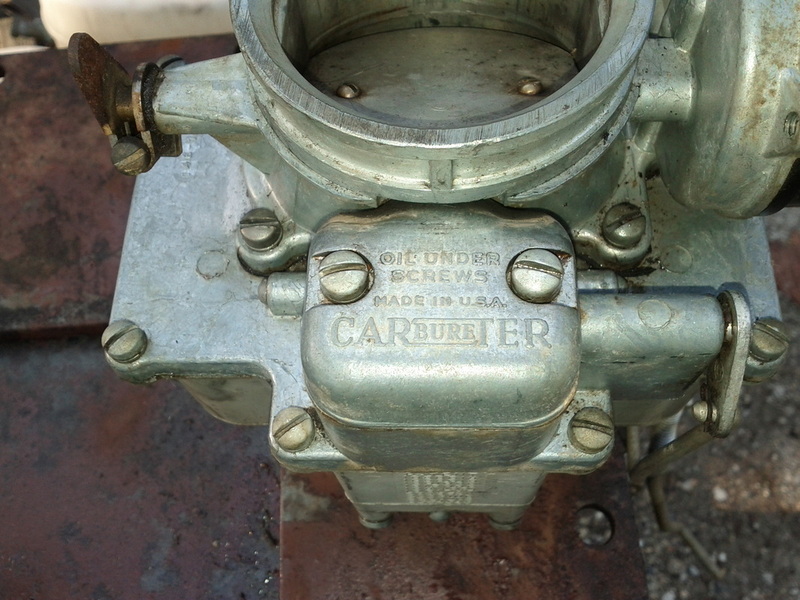 The cover was removed and valvebody cleaned up. Fresh fluid installed too!